Elite Glass & Windows Inc.
What We do: We will come to your home and give a free estimate and consultation. With over 33 years of sales and installation experience, we will advise what products will work best for your specific needs. Serving all San Diego County. Specializing in the installation of Residential Retrofit Windows and doors (no stucco damage) & New Construction windows and doors. HERO program approved contractor. HOA preferred contractor in most San Diego communities. 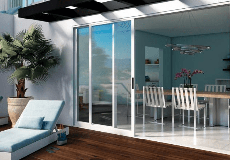 Doors to include: Sliding Patio Doors, French Swing Doors, Multi-slide doors and Bi-fold Doors. Fully licensed, bonded and insured. Carlsbad, Encinitas, Solana Beach, Oceanside, La Jolla, San Marcos, Vista, Rancho Santa Fe, La Mesa, Cardiff, Del Mar, Pacific Beach, Ocean Beach, Rancho Bernardo, Spring Valley, Escondido, North County Coastal San Diego. Elite Glass & Windows Inc. is rated 5.0 out of 5 by 48. Rated 5 out of 5 by Doug1234 from Fantastic experience from initial quote to completion of installation Ian Davies is a gem. From the time I first met him I knew he was a man of his word, extremely knowledgeable and a great listener. Every part of the transaction was seamless and the installation was superb. There were a few requests we had that were out of the ordinary and Ian and his team went out of their way to accomodate our needs. Having the job done right the first time, on budget and on time is such a rare occurance in the contractors world that when all three are met and with a smile it sure makes a huge impression! I am extremely happy with the service that Ian Davies and Elite Glass and Windows provided us. Rated 5 out of 5 by RogerB from The Ultimate Professionals!!! We have had replacement windows installed in the past on other homes, but this was without a doubt the smoothest and most professional experience yet. Ian and the rest of the staff at Elite Glass made the entire process from beginning research to final clean up completely painless. They answered all of our questions completely and in non-technical terms. They kept us apprised at every step and were a joy to work with. Elite will be our first call if decide to replace other windows in our home in the future. Thank you Ian!!!! Rated 5 out of 5 by Tom L from Great Family Business My experience with Elite G&W was outstanding. The installers, Eddy and Alec were professional, knowledgeable, courteous and willing to answer all my questions. They arrived on time and cleaned up every night before they left. Best experience I have had with people working at my house. This is a family business run by Ian and Julie who made me feel like I was not just another client. I recommend Elite G&W without any reservations. Rated 5 out of 5 by Kelly and Joe from Great service and product! Today we had our sliding doors and a picture window replaced. The installers Eddy and Alec were wonderful! They were very professional, friendly and were meticulous about caring for our marble floor and carpet during installation. We are very happy with our experience with Ian, Julie, Eddy and Alec and will continue to work with Elite. Great job! Thank you! Rated 5 out of 5 by Amy J from Fabulous team. Fabulous product. Elite Glass and Windows has worked with us to replace every window in our house over the past 4 years. Ian and his team are professional and knowledgeable, making the entire process easy and stress-free. I highly recommend their team, services and product.